Great bourbon that perfectly meets the balance between sweetness and spice. Yesterday there was the last sip from the bottle. 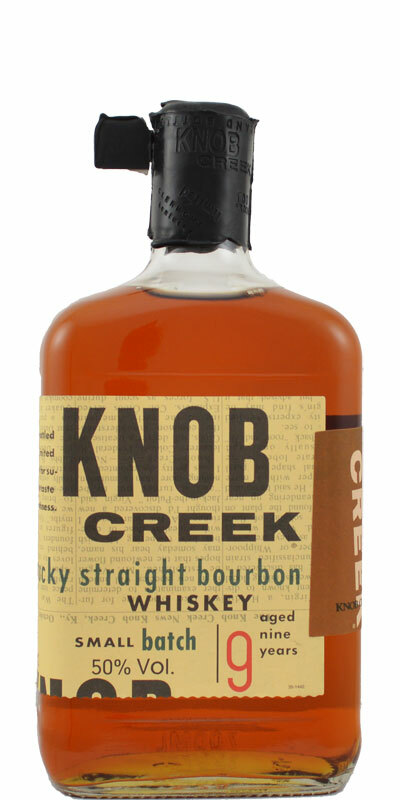 The Knob Creek 9 is a very successful bourbon with the classic notes and enough alcohol. Shortly after opening, the KC9 still has a rather alcoholic note, which, however, at the latest after half of the bottle thanks to oxidation gains. In my view, with the Four Roses Single Barrel and EC12 one of the best standards. Too bad that the production of the KC9 was stopped or replaced by a NAS product. Clear purchase recommendation! This is a top draw, really enjoyable bourbon, and at a great price. Very compelx concerning the nose. A bit sharp on the palate. Vanilla, bourbon, sweet burned sugar (almost some sherrynotes), pickled vegetables, maple wood, menthol in the mix with some honey, orange scale, cardamom, dried fruits. Sweet herbs in the mix with some honey, again some menthol, caramel, bourbon. Long (surprisingly). Honey, herbs, spices. Rough, young and cheerful. Good value. Tons of wood, acetone, slightly artificial sweetness of vanilla and sugar cane. Same as the nose, sweetness of vanilla and sugar, handful of spices and a few wooden planks freshly covered with varnish. Medium length, wood dominates here and the spices coat the mouth. Caramel, cinamon, dark chocolate and cloves. Powerfull, but a little alcoholic. Cinamon and clove. Hints of vanilla and grass. A bit medicinal in a way. Not extremely long, mainly on caramel and medicinal herbs notes.